Whether it is a swimsuit, crop top, or handbag, fringe is everywhere! Since this trend is so widespread, you can find affordable options just about anywhere. This look features a fringe vest from Zara, fringe swimsuit from Victoria’s Secret, & fringe purse from Rocio. I purchased my fringe swimsuit is from Victoria’s Secret ($54.50) just in time for my trip to LA this week, & it is has truly been a wonderful investment. Super stylish & affordable! Mules are also extremely popular this season, and these “Scotti” mule sandals by Sam Edelman are the perfect neutral option to go with everything in your closet (on sale for $124.90). 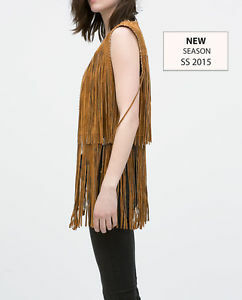 Zara quickly sold out of this fringe vest this season, but it is still available on eBay in various sizes at a great price! While this Rocio handbag is also no longer available for purchase, I did find a suitable alternative currently for sale at Zara at the bargain price of $159! Side Note: I recently purchased an alternative black leather fringe purse & receive compliments on it daily! It is a solid investment for any fashionista… Seriously, buy one!!! The article published was very interesting and practical. Howdy! Do you use Twitter? I’d like to follow you in case that will be okay. Yes, I created the blog myself with the help of a designer. His information is at the bottom of my blog. The theme is from BlueChic. I hope this helps. Good luck! My email subscription is on the right side bar. Thanks! I am about to begin a weblog. Along with several other hopeful’s, I hope to eventually make money off it. I noticed a lot of web sites do not permit you to make funds of google ad sense and factors like that. What are some websites I can start off my blog on that will let this given that it seems to be the most lucrative way to make funds off a blog?. I was very pleased to find this site. I wanted to thank you for your time due to this fantastic read!! lot more incredible material coming! I think that your web blog is actually interesting and has loads of superb information. a perfect helpful resource absolutely free. I completely adored reading your articles or blog posts. visi the web page, that’s what this web page is providing. I’ve been blogging since January. Thanks! I like what you guys are up too. This type of clever work and coverage! Keep up the fantastic works guys I’ve included you guys to my own blogroll. for? you make blogging look easy. The overall look of your site is fantastic, let alone this article! unique thoughts on this subject. truly thank you for starting this up. this website is one thing that’s wanted online, somebody with some originality. my free time reading your content. Thank you for sharing! what I was trying to find. Saved it to bookmarks. Thanks for sharing that outstanding written content on your site.